Random Perspective: US Bury the Bodies of Saddam’s Sons; Soldier Who Shot Them Hangs Their Heads on his Wall. In order to show that they will treat all Iraqi casualties of war in a dignified manner, the US has made an effort in showing that despite the fact Saddam’s sons contributed to a significant portion of the crimes committed by the regime they would still receive a dignified burial. “When I found out they were going to just be buried I was a little bit shocked,” the soldier explained, “They were the best catch I’d had throughout the entire war. In fact, if nobody gets Saddam – they will be the catch of the war. “In fact, I would rate them as one of my best catches of all time. The only catch I rate higher is the male Stag I caught last Autumn that looked suspiciously like Bambi, only after he grew up of course. “Of course, the prize was much bigger this time. I only got bet a crate of beer to do the Bambi raid but there was $15million up for grabs for Saddam’s sons. I’m not sure when I receive my cheque – but I’ve already started spending – I’m getting a special trophy room constructed for all of my prize catches. 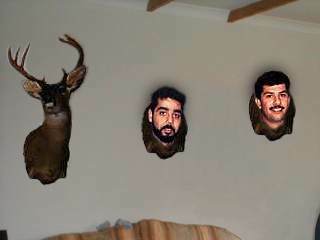 Qusay and Uday Hussein hang next to Bambi on Captain Chuck Hankman’s wall.